Last month we reported on the Aurasma augmented reality (AR) app, and compared it to the special sunglasses in the John Carpenter movie They Live, that let their wearers see the aliens secretly living amongst us. Well, the new appBlaster iPhone accessory is much, much more reminiscent of that film. It's essentially a toy gun, that your iPhone mounts on top of. Running the free Alien Attack AR game, the phone will proceed to show you the virtual otherwise-invisible aliens that are all around you, overlaid on real-time video of your your real-life surroundings. You then use the gun to shoot the little goobers before they nab you. Unlike some AR apps, Alien Attack appears not to recognize real-life objects, so aliens won't come through doorways or sit on chairs, for instance. The aliens do maintain their orientation to actual objects, however, so if you swing the gun back and forth, the aliens will stay where they are within the room instead of swinging with the gun. They can even come at you from behind, which the game's radar function will warn you about. The appBlaster itself doesn't require batteries, as it works by simply tapping the iPhone's touchscreen with two pads activated by the gun's two triggers - one fires a laser, and one fires missiles. When it's time to reload, the phone's motion sensors will detect whether or not you've performed the requisite pumping action with the Blaster. A beta version of Alien Attack is available now on iTunes, with the full version due out on July 6th. It works on the iPhone 3GS and 4, and the 4th generation iPod touch. The appBlaster is available for preorder from the UK's RED5 gadget shop for GBP19.99 (about US$32), with deliveries starting on July 6th. 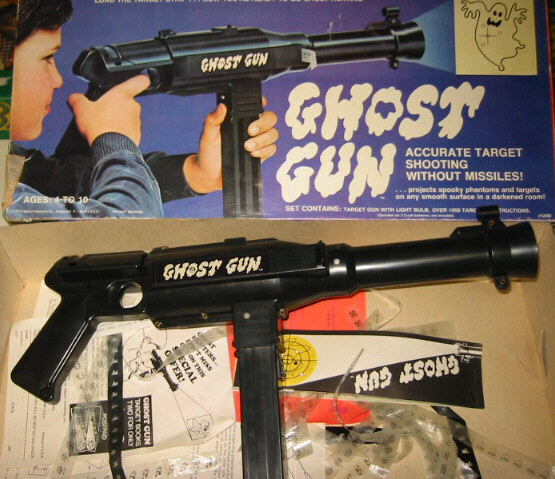 The whole thing is a bit like the Ghost Gun, a Hasbro toy from the 70s that five or six readers might remember. It projected an image of a ghost on the walls of a darkened room, which flared-jeans-wearing youngsters then "shot" at by using the gun's trigger to poke holes in a film within the gun, that the image of the ghost was printed upon ... OK, I said it was a bit like it. The video below, produced when the product was still being developed as the AppGun, shows the appBlaster in action.